Emma, a sixth grade student recently asked, "would you rather comment on the blog or would you want to write out a comment on paper?" She was talking about everything we do on computer in reading workshop. We just added online journals and reading logs to the daily routine, and she was trying to decide if she liked the change. I thought it would be interesting to see opinions about computer use in Reading Workshop. Please take a minute and participate in the poll in the sidebar. Also, feel free to comment with your thoughts about the results. From a teaching standpoint I see many benefits with computers in the classroom. Online journals make it so much easier to keep track of what students are reading, and what they have to say about their books. I can check online journals and know how SSR is going for each student. This means I can check them more often, and leave more comments. It also means no lost papers, where students lose assignments, or their reading record. From a student standpoint, no low grades from lost work is an obvious benefit. There is also the opportunity to view peers journals and comment. Commenting on the blog is a writing assignment that lets students share their thoughts and opinions to a world-wide audience. There is also the issue of writing out on paper or typing, Some students prefer one way, others another. Thanks for your participation in the poll. I look forward to learning about your feeling about computer usage in the classroom. 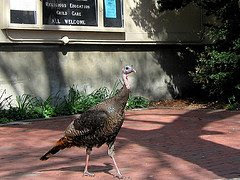 This turkey is going to school. To all the turkeys with the weekend off--enjoy your break! I will see you Tuesday. Students that have characteristics that help them succeed in Reading Workshop, will most likely achieve throughout their life. The more relaxed and student-driven workshop environment forces students to make choices. This decision making can serve as a learning model that will have life-long affects. Knowing this places a significant responsibility on teachers, if we choose to run our class in the workshop style. If a student works hard in reading and writing workshop, they will have a work ethic that will most likely lead to success in other places. Conversely, if student needs constant supervision and prodding to work, they will most likely struggle in other classes, and later in life. Similarly, the attitude they approach tasks at hand, can provide the impetus for overall academic success. Last week after the Awards Assembly, I heard a boy say, "I haven't got an award for the last 3 years. It's been since 2nd grade." I thought to myself, "what a terrible thing. This boy has been to at least 9 awards assemblies in a row, and hasn't been recognized." Me: What did you do in 2nd grade to get an award? Me: You must have done something. Student: It was at my old school. Me: So what did you do at your old school to get an award? Me: You must have done something right. Me: Do you work hard in class? 1. Do his parents ever talk to him about success? Or lack of? 2. Will he think about our conversation and decide how he succeeded before? 3. Will it have any affect on his work ethic? 4. Next year, when he is in my class, will he get an award? 5. When I see him in 8 - 10 years, will he have found the means for success? Hopefully next year he will learn the work part of reading workshop. Welcome to students attending Ball State University in Dr. Ford's class for reading educators. It is gratifying to see that college professors are interested in how blogs are being used in education and providing resources to use to compare with students' ideas on reading workshop. Your written task is to develop a graphic that identifies: (1) how your reading workshop is like the examples in the web resources, (2) how your reading workshop is different from the examples in the web resources, and (3) some aspects of the reading workshops you examine that you would like to "borrow" to use in your classroom. I found this an intriguing task. In fact, I even checked out the other blogs listed. It seems like the rest are basically "how to's." Now I am going to have to study them to see what interests me. I do appreciate the fact that a college professor is encouraging realistic research, and asking his students to compare it to what they do in their classes. Thank you for stopping by The Reading Workshop. I hope you find something useful, or at least interesting during your visit. While you are here, please join us by commenting with your thoughts and opinions. Probably from reading his teacher's blog! According to Doug Johnson, on the Blue Skunk Blog most of us would prefer shallow wit to deep intelligence in our writers and speakers. Thank goodness. Granted, this is taken from his biases, but I read it on the internet, so I know it is true. I guess that justifies publishing much of what we read on blogs. Using this line of reasoning, I can write many a post that veers on the edge of smartalecky. I can throw it out there and justify it by saying that I am just trying to share a little humor. Oh well, here it goes--my top 10 tired and overused comments at an awards assembly. 1. I am so proud . . .
2. She is doing sooooo much better . . .
3. I never get an award. 4. He gets all the awards. 7. This is the best class . . .
8. I knew I wouldn't get an award because he doesn't like me. 9. She is a teacher's pet. 10. Keep trying and you will get an award next time (when pigs can fly). Oh sorry, somehow my thoughts snuck in here. Can guess which are the teachers' comments and which are the students? By the way, have you figured out that we had an awards assembly yesterday? I recently attended a district-wide grade level inservice. This is a required "training" where testing, test results, and teaching for better scores are discussed. The meeting had just started when the presenter started talking about an extremely successful friend from another district. She took the fun out, and just concentrated on the curriculum from the content standards approved by the state. Well, not the fun, but the fluff. She only taught 'what she was supposed to teach.' If we want to be successful we need to get this fun or fluff out of our teaching and only teach what we are supposed to teach. Hello--did you check out our report card? According to it we are an excellent school. And who would believe it, we actually had a little fun. Even if we were only an Excellent school, not Excellent with Distinction, would you really choose to give up all of the fun, just for test scores? 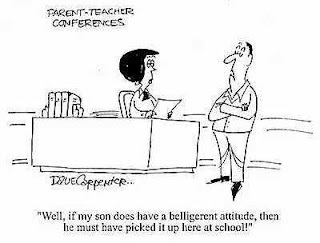 Is this what parents in our district really want? I can assure you it is not what students want. So where do we go from here? Should the district have scripted teaching where fun/fluff is removed and teachers are told what to teach? Should testing and content standards be so important that they totally drive instruction? If a student has a question that doesn't fit in with the day's script, should we say, "sorry, but we can't discuss that because it is not on our curriculum map until May?" Maybe we should have the new Reading Workshop. We teach the content standards and only discuss indicators as outlined by the Ohio State Department of Education. Students can think and can question, but only if it relates to the indicators we are teaching today. Where are the Workshop "How To's?" What is most important to know about reading workshop? Some might say knowing what mini-lessons to teach is especially important. Others might think the format and how to set up a workshop is most significant. Activities students complete might be the choice from some that carries the most weight. And the next question is, where should a blog called The Reading Workshop focus? Should it be on how a workshop looks and what activities take place? Or is it about students from classes in a workshop? I started thinking about this after I got this email. I really like reading your blog . . .
Have you ever considered more posts with "how to's?" So many of your posts are about the students. I enjoy reading about them, but I think most teachers would like more on how to do reading workshop. After reading this email a few times, and thinking about it for a couple of day, I thought about what controls my reading workshop day-to-day and how that has changed. Originally it was the "experts." I read In the Middle and modeled my class after it. Today there are thousands of sites to get the "how to's." Nancie Atwell is still an excellent resource for the fundamentals of reading and writing workshop. The internet is filled with ideas for teaching, and examples from classes. For me though, reading workshop starts and ends with the students. Every activity is only as valuable as it is relevant to the class I am teaching. The best book only matters if it reaches the student. And it is only the best book because of what it makes a student think and feel. The best lesson is only good because of how it impacts the class and the students. A good journal topic only matters if it lets a student share a thought, idea, or opinion that is meaningful to him. It all starts and it all ends with the students. That should be the focus. If a 12 Year Old Gets It, Why Don't You? Constant controversy about spending on education, NCLB, and the value of technology in education controls the news media. In this Reading Workshop, one twelve year old brings it down to the most basic level. I like typing on the wiki page because if I have something to say that's very exciting I can type it. I just finished a book called Soldier`s Heart and I couldn't tell my friend Dylan because he is reading the same book. I didn't want to spoil the ending for him so I am anxious to get it out. So I typed it on the wiki page and I felt relieved after that. I like this year because I'm using the computer more and having fun with it at the same time. There are those who doubt the value of technology in our schools. They don't think the dollars spent are worth it. They believe schools should focus on the three R's. They want high test scores. They want students in their seat, being quiet, and doing their work. When they picture a class, they see the teacher in front lecturing, while students sit in their seats, taking it all in. I say, please get out of your Model T. The Industrial Revolution is over. We are moving on. There is a new expert in town. His name is Seth and he is a twelve year old that knows what makes school and learning challenging and interesting. The time to move on is here. Hey Jr. High, are you listening? We are sending you tech savy students that want to be challenged. Quit diagramming sentences and figure out how you are going to make learning meaningful for Seth. Bree comes in class every day with a big smile. And at least 3 or 4 times a day, she has something smart to say. Then she just grins. It's almost like the other teachers hired her just to come in and aggravate me. I would like to yell at her, but she always does her work, and does her best. She walks in the door with a great attitude and never complains. She is a star! But, I think her goal for the year is to jab me every day and then laugh about it. And, she is reaching her goal. When I dish it out, she grins and comes right back. Today, after one of her jabs, I had this conversation with her. Me: You are a pain. Me: You are a pain in the lower back. 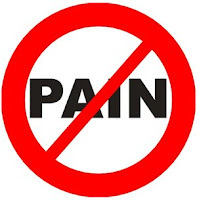 Me: You are a pain in the lower, lower, lower, lower back. Bree: Mr. M c G u i r e, that's the same thing my dad always says. Kids like this are what make reading workshop so special. You gotta love it. I tried Google and Yahoo, but I could only find bobbleheads and gremlins. I got a purchase order, all ready to turn in for approval. Can anyone help here? Where did Kara come from? It started when students came to the circle for the mini-lesson As I discussed the topic of the day, I looked across at Kara. As she started to get it, she began nodding her head. The better she understood, the more she nodded. When she was not getting it, she looked at me like I was way out there in outer space, staring in a way that said, "what is he talking about?" Kara didn't even know she did this until I told her. When I first started noticing it, I watched for a few days, just to be sure I was reading her right. After a week, I decided this was a fail-safe method of knowing when students in this class understood. As I finish the mini-lesson, all I have to do is look at Kara and I know if the day's lesson needs more explanation. As a teacher this serves as a good reminder of just how important it is to focus on the students as I teach. The key to knowing what is working and what isn't, is in their reaction and their body language. Although all teachers know this, sometimes we tend to forget how we need to concentrate on the student the entire time we are teaching. Here is the problem--Kara makes it too easy. I have immediate feedback on everything I say. I either get the stare, or else the head nod. I have decided I like this. So, where do I get a few more head nodders? I have two other classes. I want one in each of those classes, and one to spare, in case someone is absent. Anyone know where I can find a few more head nodders? P.S. They are the kids that are always paying attention. Kids live for music. There is never a day that they don’t listen to music. BUT, we rarely use it as part of our educational program in intermediate classes. Many teachers in the primary grades use songs to teach letters, words, numbers, and counting. For some reason though, we rarely see it in 4-8 classes. And, interestingly enough, this is the time when music begins to play a major role in our students’ lives. Can I have some money to buy Rhianna’s CD? That video is not appropriate, Emily. How can you do your homework with that music up so loud? Will you give me money to get tickets to go see Pink? All of this was said in the last few days in my house. Do you ever hear similar comments? Yet even though we know that music is totally intertwined in our lives, we rarely integrate it into the curriculum. So, we are singing as part of Reading Workshop. Each day for 10 minutes (usually two songs), lyrics are shown on the wall using the projector. Music is played and students sing along, reading the lyrics as they sing. Every week, we sing at least one new song. As students get too familiar with a song, they know all of the words, so they stop reading. Changing songs is important to keep students reading. It also helps with vocabulary instruction. With each new song, there are new words to learn and discuss. I only know this mom second hand, but I know her daughter. And I keep learning more about what this mom is doing to make her daughter successful. And the more I know, the more I respect her. She doesn't have a computer, but she gets on the blog at work, just to see what is going on in her daughter's class. When she reads a post about a struggling child, she relates it to her struggles. She tells her daughter about mistakes she made. And she comments with advise for a struggling child, because she cares. She doesn't try to hide her mistakes. She uses them to help teach her daughter about making good decisions. She has talks with her daughter about school, and grades. She worries about her daughter, and asks her about assignments. She is not checking up. She is making sure that her daughter will succeed. And the daughter is nice to other kids. She does her assignments. She works hard. She never complains. She never argues or disrespects other students. She is a daughter you can be proud of. I found a combination that is better than peanut butter and chocolate. We took our class wikipage and combined it with journals students write about fictional books. Then we added a table to log daily reading. When you put it together you have online book journals. Each student has their own page. Each day after Sustained Silent Reading (SSR), they have a few minutes to write in their journal. On some days, they have an assigned topic. This usually relates to the topic of the day and will also be discussed during writing assignments, read aloud, and Study Island. Recently we focused on making predictions. The assignment for students was to write about what they thought might happen in the future in their SSR book. Here are some examples of their work. I predict that Harry will have to fight a Chinese fireball dragon for his first task in the torment because a lot of bad things have been happening to Harry. Like a reporter came to the school and said bad things about Harry in a really BIG newspaper. I think Ron and Harry will start talking to each other again because Hermione has tried to persuade them to try to talk to each other. I hope so. The book is really weird without Ron in the book. It's like he's not even there. I predict that Rusty will get into many fights with the other Clans. I also think that Rusty will not have the Warrior blood to become a warrior in the Thunder Clan. But I am only on page 30. Rusty is just a kittypet who has lived in a Twoleg place his whole life and has never stepped foot off of his garden post. That is why I don't think Rusty would make a very good Warrior. 11/7/08-Something Upstairs is really a good book. What I read today is that Kenny is going to help Caleb find his murderer. Then he told Caleb that he is not real sure if he's going to help. I predict that he is going to help. Then they both can prevent Caleb's death from happening. I think that Kenny should help Caleb. Then I'm not real sure he should go back in time again. I think he should probably stick with the library. I don't think he will though. I would help Caleb just because he was a slave and if he helps he could prevent it all from happening. He could change Caleb's history. I also predict that Kenny won't move for a couple of years. He's probably going to live there for three or four years. This online journal keeps a running record of what books students read, how long they read, how many pages they read, and their thoughts about books. It is also a great way for me to assess their comprehension of their book, read about their thoughts, ideas and opinions, and comment on them. Although we have just started this process, I am already seeing significant benefits. 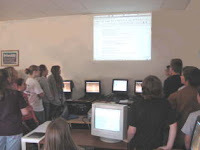 Twelve years ago I started on a quest to use technology to improve language arts instruction. I had one computer that worked a little bit, a little bit of the time. Fast forward to today, with a little investment each year by supportive administration, a good district Technology Coordinator, and we have a class where technology is fully integrated into the classroom. Each student has one of a total of 24 Dell OptiPlexes at their desk. These refurbished machines were purchased for about $100 each. These are networked into our LAN, with internet access and a storage server. A networked HP4240 laser printer provides economical printing. These PC's are loaded with all free software. They use the Ubuntu operating system. This Linux based program eliminates the problems of spyware and adware that caused so many issues when we used Windows. For word processing, we use Open Office 3.0. This newest version works seemlessly, and will read and save .doc files from Microsoft Office. For internet access we use Firefox, the Mozilla based browser. For instructional purposes, I have an Optima DLP projector. This is used for whole-class instruction so students can easily see what is being taught. I can project the computer's image onto the wall, making a six by six image. An Avermedia doc camera is hooked to the projector. The doc camera takes a picture and feeds it into the projector. I use this to show examples of students' work. I also have a digital camera that is used to, among other things, take pictures for the blog. I have a desktop computer that I use to keep grades, write lesson plans, write the blog, and email/message parents and students. I use a laptop to bring work back and forth between school and home. When you walk in the classroom, the use of technology is everywhere. Teachers often marvel at all of the equipment. The most amazing fact though, is the cost, or lack of. At the most, there is $5,000 invested. So for much less than $1,000/year, students can have computers to use as a tool, every day in language arts. I average about 60 students total each year in sixth grade. This means this technology-based classroom costs about $16/student/year. I have to ask, why doesn't every language arts teacher have a class equipped with technology? This journey we started twelve years ago has sure paid off for the students of Laurelville. On each day in their assignment book, students will put a label with this on it. Instead of logging on their reading log, they will be posting it in their assignment book. This will eliminate the need to carry and keep track of an extra sheet of paper. Also, students already have to take their agenda book home anyway, so they will have it when they need it. It will also keep an ongoing record of books they read, how long they read, and how many pages they read. Students will be keeping an on-line comprehensive reading log on their book journal page. Students must read at least 4 times/week for 15 minutes each day. For more information see the Read at Home homework post. My daughter, Heather got this message from a friend she hadn't seen in a while. She was glad to hear from her, and is going to make plans to see her soon. Heather, and her friend are both brunettes, but capable of blonde moments. I might miss our blonde times, but I sure don't miss are blonde times together. C'mon boys, you can do it. All you have to do is just grow up a little. The girls are waiting. The teachers are waiting. I am sure your parents, and brothers and sisters are waiting. We have high hopes for you. We all want you to do well. We believe in your ability to act age appropriate. The rest of the class has done it, so you can too. And your life will be sooooo much better. The sixth grade class this year has been amazing. Their behavior has been exemplary. They do their work, to the best of their ability. Assignments get done, and students give their best. The teachers have all commented on what a great class we have this year. But there is a group of boys that stick out from the rest. They laugh at all of the wrong times. They act so goofy that the girls just look at them and shake their heads. The other boys just ignore them. No one seems to know what to do with them. Usually when sixth grade boys come back to school in the fall, the fifth grade behavior is long gone. They grow up over the summer. But this small group of students just doesn't get it. In the race to maturity, they are hopping along on one leg. Their car seems to have a flat tire. Will they come out of it? Will they grow up, and become students that care about their grades? And their reputation? Only time will tell, but I hope they grow up this year, just for their own sake. C'mon boys, you can do it. You may not win this race, but at least join in with the rest of the sixth grade. We showered outside when it rained. What a great substitution for we played in the rain. 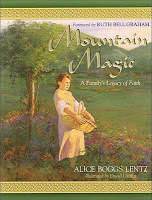 This excerpt from the book, Mountain Magic, written by Alice Boggs Lentz showed how word substitution is used in fiction. I discovered this during Mrs. Wolfe's read aloud in a fourth grade-six grade co-writing project. Have a good fictional word substitution? Please share it. I was thinking about the role of this blog in my class. I was trying to decide if it was valuable, and if I needed to make changes or adjust my goals to better meet the educational needs of the students. Once I read this comic strip though, it all became clear. I am a blogging genius. As long as I just keep hacking away at the keyboard, I will achieve my goals, and the blog will be a success! Seriously though, thank you for taking the time to read this blog! I was driving yesterday morning, about a mile from the school and saw this sign. At first it caught my eye, because I have beagles. I am not sure if a beagle is the same thing as a begal, but I think it might be, at least at one house. Now maybe you aren't the best speller. In fact, maybe you can't spell very well at all. Maybe you count on spell check, and the computer's dictionary for everything you write. Maybe you use Answers.com like a peanut butter sandwich uses jelly. Here is the problem. What if some day you have a begal puppy for sale? Will you have drivers running in the ditch, laughing and shaking their heads, while they point at your sign? Here are your choices, either learn to spell or just buy this product. I like Dylan, Mr. McGuire. I like him and he likes me. He's my friend, Mr. McGuire. Laurelville has inclusion of handicapped students. In other words, students with disabilities on an IEP (Individualized Educational Program) are mainstreamed into the regular classroom to the greatest extent possible. I am a strong advocate of inclusion, both for the benefits of student on IEP's, and those in the regular classroom. This year, there are two students included, with significant special needs. They join us in homeroom, special classes like art, music, and P.E., and for part of Reading Workshop. At the end of the first nine weeks, these students have made tremendous progress. Part of this is due to a teacher's aide, C. Conrad that is motivated to help them to the greatest extent possible. The real success story here though, is my homeroom. I have never seen a group of students act so kindly towards classmates in need. And all of the credit is theirs. I have never had to tell them to be nice, or to be helpful. They have just consistently made decisions that demonstrate caring and helpfulness. I can't even describe how proud I am to be part of their success. I like Dylan Mr. McGuire, and he likes me. I'm his friend, and he my friend, Mr. McGuire. He's my buddy, Mr. McGuire. I like Dylan, and he likes me.